InterContinental Miami hosts their 18th Annual Make-A-Wish Ball Kick-off Celebration! It's that time of the year when the Make-A-Wish Foundation of South Florida celebrates their upcoming ball and announces the progress of their fundraising efforts. On Thursday, June 7th, I attended a lovely cocktail event hosted by InterContinental Miami in honor of the upcoming 18th Annual InterContinental Miami Make-A-Wish Ball. Attended by more than 200 of South Florida’s leading philanthropists, the exclusive gathering shed light on the importance of this cause and this year’s India-themed Ball, to be held on Saturday, November 3rd. Shareef Malnik (pictured above on the left, photo by Nathan Valentine of WorldRedEye.com), Ball Chairman and Proprietor of The Forge Restaurant, and Norman Wedderburn (pictured above on the right), President and CEO of Make-A-Wish Southern Florida, were happy to announce that the "Chairman's Challenge has received an incredible response from prominent community philanthropists. Cheers to a successful year so far and make sure you visit the Make-A-Wish Foundation website for more information on how you can help children with life-threatening medical conditions. Above: Robert Hill (Ball Host and General Manager of InterContinental Miami), Emily & Trevor Daycock, Norman Wedderburn and Shareef Malnik (photo by Nathan Valentine of WorldRedEye.com). “I am honored to be a part of a mission that has impacted so many lives,” said Robert Hill. “As a result of 17 years of fundraising, the hotel and Foundation have together raised enough funds to grant 2,300 Wishes for children with life-threatening medical conditions across South Florida." Above Left: Beatrice Clancy and Dr. Sanford Ziff, Philanthropist and Founder of The Sunglass Hut, striking a pose during the event (photos by Nathan Valentine from WorldRedEye.com). Above Right: Linda Levy Goldberg and Chris Lones (photo by Nathan Valentine). 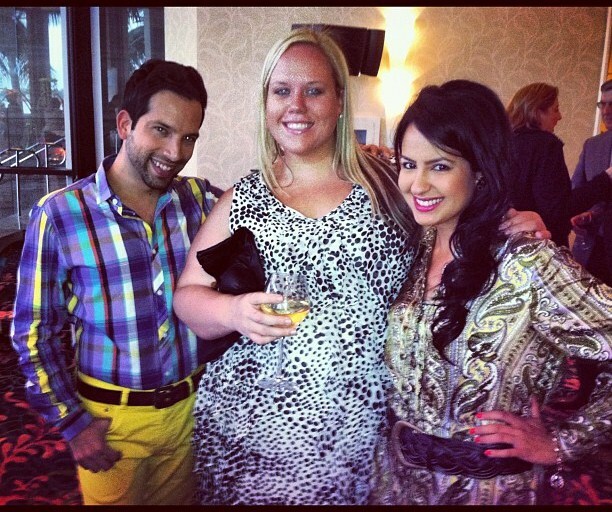 Above: My friends (Gino Campodonico and Stacey Russell) and I during the cocktail event. For those interested in becoming involved with this organization, the mission of Make-A-Wish Southern Florida is to grant the wishes of children with life-threatening medical conditions seeking to enrich the human experience with hope, strength and joy. The chapter’s goal is to grant more than 500 wishes in 2012. For more information, contact the Foundation at (888) 773-WISH or log on to www.sfla.wish.org.